My grandmother used to grow wonderful, large baskets of cascading fuchsias. 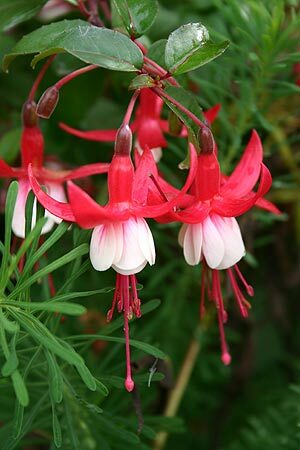 I still remember admiring the red and white blossoms of what may have been Fuchsia 'Swingtime' in the baskets that surrounded her porch. I loved watching the hummingbirds dart in and around them. It may be a family tradition to grow fuchsias; my mother grew them, my sister, and so do I. Perhaps someday my daughter will grow them, too. There were years I wanted to have baskets of fuchsias hanging on my porch and could not afford the asking basket price. The year I discovered hardy fuchsias growing in someone's garden changed all that. Now, I always have one, whether it is in a basket hanging on my deck or growing in the ground. There are many cultivar choices available. Living in the Pacific Northwest, our climate puts few limits on choices we can grow. 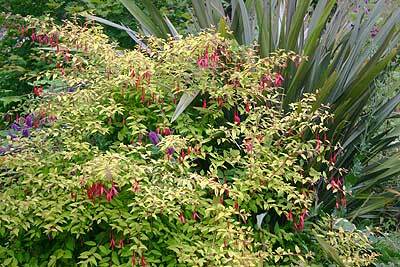 Many hardy fuchsias do quite well here, thriving in our mild summers and wet winters. The only precaution I take is giving them well-drained, humus rich soil and mulching them well in the fall by adding manure, compost or leaf mold. In spring, the plants send out new growth and by summer, they begin to bloom. Fuchsias continue to flower well into fall until first frost. During mild winter years, some of them bloom throughout the dark days of winter. Some years when we have an exceptionally cold winter, fuchsias will die down to the ground. Before pruning in spring, wait until leaf buds swell, then prune out dead twigs, or prune down to the ground if winter knocked it completely back. For established fuchsias, I fertilize in spring and sometimes in early summer. Younger fuchsias are fed monthly with a complete organic fertilizer. With so many fuchsias to choose from and not enough garden to accommodate them all, here are a few of my favorites that I grow in my Pacific Northwest garden. Fuchsia 'Tom West' is one of my favorites. 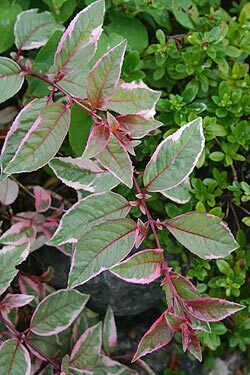 With stunning foliage of cream, green and pink along its red stems, the blossoms are almost an after thought. The flower's purple corolla and red sepals tend to blend in with the foliage. I hear this variegated fuchsia grows well in hanging baskets. I imagine it looking spectacular confined to a basket, although, I have not tried it. In my garden, it grows freely as a prostrate plant, cascading down over a rock wall. The pale pink and lavender flowers of this cultivar make you believe it is a delicate plant. I am pleasantly surprised to see it reach upwards to eight feet tall and as wide, when I planned on it being much smaller, according to the books. Obviously, this fuchsia cannot read and has surpassed its allotted space. Two vines reach into it and the fuchsia seems no worse for the weight of a passionflower vine and clematis twining around its frame. Add some hot salsa to your garden by adding this golden-leafed cultivar. This one takes the heat better than many fuchsias. I grow mine next to a large phormium and the pair compliments each other, while Hebe 'Paula' creeps in from the other side adding her purple flowers into the mix. The scene transports me to the bright colors of more tropical climates. Fuchsia excorticata, a native of New Zealand, grows 10 feet tall, and what a marvel to walk under and look up into its unusual flowers. Its height, remarkable copper and brown colored bark that hangs in strips, gnarled trunks and unusual flowers with bright blue pollen make this perennial unique. Mine has yet to reach that height; I look forward to the scene I painted in my imagination to come to fruition. This sub shrub is necessary for a fuchsia collector! Another New Zealand native, Fuchsia procumbens, makes an interesting ground cover of unusual flowers with purple sepals and gold corolla. Even more unusual is that the flowers are upright with red stamens, blue pollen, and later pink, edible fruit. 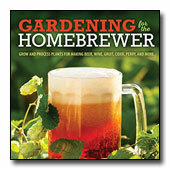 Perhaps this should be in my edible garden; recipes anyone? I will let you have the first taste test. Nothing in the garden says its summer more than fuchsias and the hummingbirds who stake their claim to these hardy plants. There are many more fuchsias with photos and cultural advice for each one in the Plant Gallery and Growing Guide.